TODAY WE COVER Season 6 Episode 19 "Your Hit Parade"
PLOT SUMMARY: After 11 days of no casualties, the Swamp Rats are so bored, they invent "Cranko," a game mixing chess, poker and checkers. Radar takes Winchesters turntable to play the new records the 4077 received; Colonel Potter believes it will alleviate boredom. 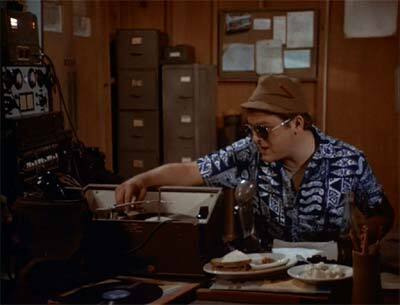 Suddenly, the OR gets beyond crazy, Col. Potter encourages Radar to keep the tunes a-coming. The wounded soon overflow into the Mess Tent, Officers' Club and The Swamp as adjunct hospitals. Klinger is scrounging for blood--especially the AB- blood one wounded GI desperately needs. The medical staff is forced to use plasma; everyone is on automatic pilot. Radar becomes a cool cat; his confidence over the air grows quickly. Colonel Potter continues to request the same version of "Sentimental Journey" sung by Doris Day.